CULTRON001 - Sunrise on Mute | Joomla! The first CULTRON release is upon us. CULTRON branch of Culture Assault Records delivers sounds from the realm of general electronica, tracks by our artists who experiment with different types of music, which normally you wouldn't expect from CULTASS or CULTDUB releases. 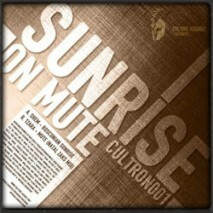 CULTRON001 - Sunrise on Mute shows a more chilled out and mellow side of our artists. Shem and Tzara delivered to amazing tracks for this first CULTRON release. Tzara - Mute (Natal Zaks Mix): minimal house track with deep bass and pumping beats, but yet delivering a catchy trumpet hook which adds up to the laid back vibe of the whole track. Check out the previews of these tracks and make sure you go to online stores listed below to grab the full versions of these. Expect to hear more from CULTRON line, as new artists are coming in and a list of tracks scheldued for release is ever growing. So sit back, relax and enjoy the ride!